The New Zealand Civil Aircraft blog (http://nzcivair.blogspot.com/) recently pictured a rather forlorn looking Aero Commander 500, ZK-CWP, in the Air New Zealand Engineering Training hangar at Christchurch (http://nzcivair.blogspot.com/2010/03/air-new-zealand-engineer-training.html). ZK-CWP saw service with four small commuter airlines. It began its commuter airline work with Rotorua’s Geyserland Airways in 1969. Later, the airline division of Geyserland Airways was split from the charter and scenic operation to form Air North; ZK-CWP was one of three Aero Commanders operated by Air North. 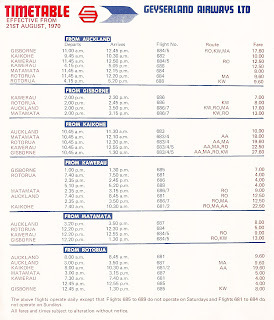 In 1983 it saw service with Mid North Air flying between Kaikohe, Dargaville and Auckland. From 1993 to 1996 Air Coromandel operated it on their flights between Whitianga and Auckland. 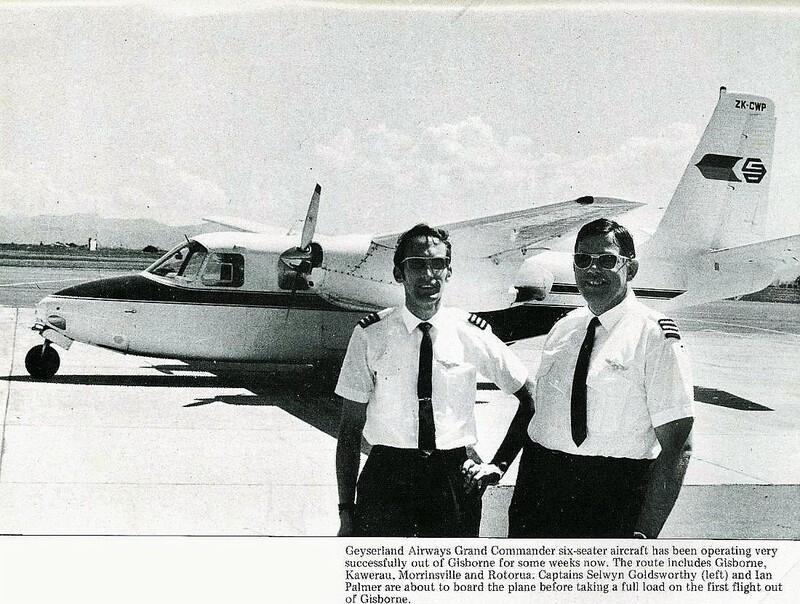 The following piece by Bruce Gavin traces the history of ZK-CWP’s first operator, the ORIGINAL Geyserland Airways Ltd as opposed to Geyserland Airways (1974) Ltd. 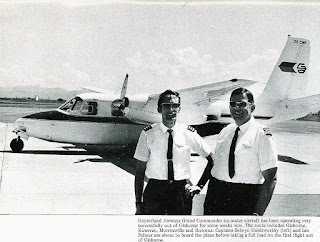 In 1969 Ian Palmer, Sel Goldsworthy and Fred Ladd formed Geyserland Airways Limited to take over the scheduled airline, floatplane, and some of the charter operations previously operated by the Rotorua Aero Club. The aero club had built up a substantial air charter business under the trading name of ‘Rotorua Aerial Charter’ as well as a small airline business, which traded as ‘Geyserland Airways’. The airline division used Aero Commander 500 ZK-CWP (backed up by Cessna 172s) on a twice-daily service from Rotorua to Auckland with a stop at Matamata on demand. The aero club had found that the effort and finance needed to develop these facets of its operations were requiring too much commitment, and that the traditional aspects of the aero club were being neglected. Ian Palmer, who had been the aero club’s Manager/Chief Flying Instructor, left the club to become the Managing Director of Geyserland Airways Limited. Geyserland Airways Limited was formed at the end of March 1969 but operations continued to use the aero club’s air services licences until 17 June of the same year. At this time the licences were transferred to the new company. Geyserland Airways' Aero Commander 500 ZK-CWP at Rotorua. The company then set about developing business in the airline, air charter, floatplane, scenic flights and pilot training fields. An early move was to expand the airline service by taking over the Auckland/Kaikohe route from NAC, plus an extension southwards from Rotorua to Gisborne. To service an expanding market, Geyserland Airways Ltd began the search for a larger twin-engined Aero Grand Commander to supplement the smaller Aero Commander 500. Geyserland’s first flight to Kaikohe took place on 22 August 1970 and was piloted by Sel Goldsworthy in ZK-CWP. 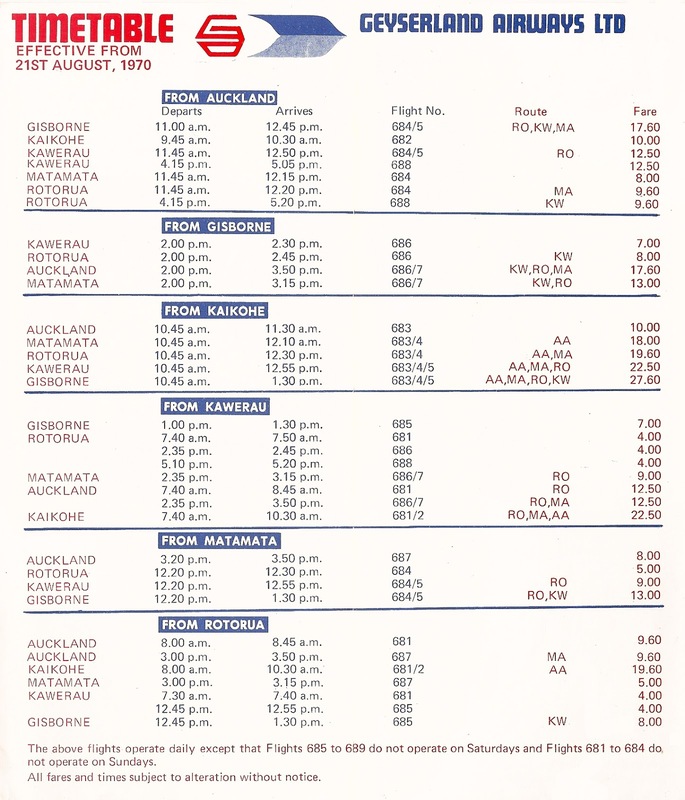 Services from Rotorua to Gisborne via Kawerau began in December 1970. Meanwhile Palmer was involved in a forced landing in Ethiopia while delivering the newly purchased Grand Commander from the Kenyan Police Air Wing. The delays caused in delivering the aircraft to New Zealand and the consequent repairs required meant the aircraft was not finally introduced into service until April 1971. The floatplane operation was expanded to Taupo in mid-1970 from the initial base at the Rotorua lakefront. On 9 August 1970 Fred Ladd was involved in an incident in Cessna 185 floatplane ZK-CFE, which suffered a total engine failure. Ladd miraculously crash landed the aircraft on a farm near Orakei Korako. Ladd and the passengers suffered minor injuries but the aircraft was a total write-off. Early in 1971 Ladd severed his connections with the company and formed a scenic flight operation with the Rotorua Aero Club known as ‘Volcanic Wunderflites’. Also early in 1971 the airline expanded its timetable to include Napier, Taupo, Hamilton and Kerikeri on an air taxi basis with flights being made to these centres only if traffic was available. Leased Cessna 185 ZK-CKU operated many of these extra services. In August 1971 NAC withdrew its air service from Kaitaia because of soft patches in the main runway. Geyserland Airways Ltd gained a temporary air services licence and began to serve Kaitaia from Auckland twice daily. However less than a week after the service began on 30 August 1971 Aero Grand Commander ZK-DBQ suffered the collapse of the right main undercarriage leg when landing at Kaitaia on a secondary metalled runway. Cessna 310 ZK-CFG was leased to support both Aero Commander ZK-CWP and Cessna 185 ZK-CKU to operate the company’s airline services. This included the temporary operation to Kaitaia, which lasted for several months. Meanwhile ZK-DBQ was flown to Auckland for repairs. On 26 September 1971 the airline began a contract to fly the Sunday Herald newspaper from Auckland to Wellington in the early hours of Sunday mornings. For a time in 1972 the airline flew the New Zealand Herald from Auckland to Napier in the early hours of the mornings from Monday to Saturday. The aircraft was then flown north to Rotorua to begin the daily schedule. On 16 January 1972 ZK-DBQ again suffered another landing accident when the loss of power from both engines, followed by a surge from the starboard engine was experienced on final approach to Wellington Airport. The aircraft was thrown off course and struck a pile of rubble, with the port undercarriage being torn off. When temporary repairs had been made the aircraft was flown to Christchurch for permanent repairs by NAC. Grand Commander VH-EXZ was leased from Australia as a temporary replacement until Geyserland’s second Grand Commander ZK-DHF superseded it in March 1972. In April 1972 the airline operation was transferred to an associated company, Air North Ltd but the floatplane and air charter operations continued as Geyserland Airways Ltd. Also in 1972 Geyserland Airways Ltd developed an air charter division known as ‘Skyways Air Charter’, which utilised a leased Cessna 182 ZK-DID. Ian Palmer was by this time devoting much of his time to the running of the airline Air North Ltd and in October 1973 the floatplane division was sold to a new company known as Floatplane Air Services Ltd, headed by Brian Brooker. This was followed by the sale on 4 September 1974 of the land based air charter operation to a new company, called Geyserland Airways (1974) Ltd, headed by Mark Malone and John Burns. From this time there were three separate companies each operating independently, in different fields and with different shareholdings. The original Geyserland Airways Ltd then ceased operations. VH-EXZ Aero Grand Commander 680FL (680FL-1379-48) leased from Executive Air Services Pty Ltd of Melbourne for several weeks in early 1972. Executive Airlines Pty Ltd owned VH-EXZ from 22 March 1965 until 18 October 1979.